Misaligned or maloccluded teeth are extremely common, but they can have a detrimental effect on your dental health. Teeth that are crooked can be more difficult to clean, which may lead to tooth decay, gum disease and tooth loss. An improper bite can increase your risk of uneven wear, tooth damage and TMJ disorders. Orthodontic treatment is designed to not just improve the appearance of your teeth but also improve your overall dental health. Our expert for Invisalign in Torrance can assess your smile and help you understand your options for orthodontic treatment. Traditionally, metal braces have been used to correct misalignments and malocclusions. Today, many people are able to choose between traditional metal braces and Invisalign. Invisalign plastic aligners are virtually invisible when worn, and the clear retainer-like aligners are more comfortable and, in some cases, produce results even faster than ordinary braces. Our Torrance Invisalign dentist can explore your options with you so that you can determine the treatment that will best fit your lifestyle. If our expert for Invisalign in Torrance determines you are a candidate for Invisalign, you will begin with a comprehensive dental evaluation, 3D images of your entire jaw and a treatment plan that will be used as a blueprint for your new aligners. A dental laboratory will create your aligners, which you will change every two to three weeks according to your plan. Because the aligners are removable, you will be able to brush and floss your teeth just as you always have, and you will be able to remove them to eat or for special occasions. For the best results, you will need to wear your aligners for 20 to 22 hours a day. Treatment time can vary based on your individual needs and goals. Our Torrance Invisalign dentist can use Invisalign to treat gapped teeth, cross bites, overbites and under bites as well as overcrowded or crooked teeth. Invisalign is a more comfortable and often faster orthodontic treatment option that can help you achieve a healthier, more attractive smile. 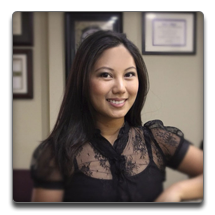 If you like to learn more about Invisalign, contact our cosmetic dentist in Torrance to schedule your consultation.